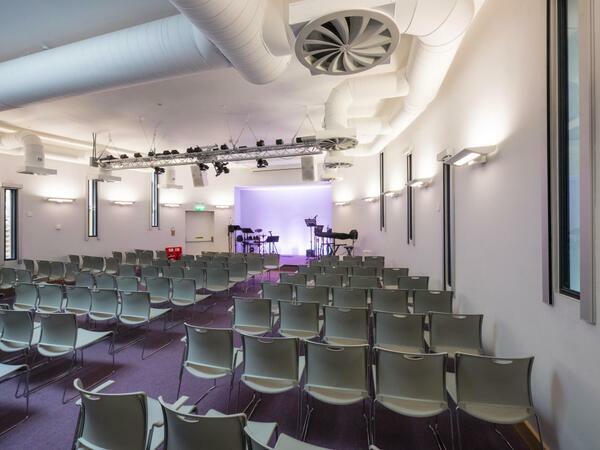 Esher Green Church Completes - MEB Design Ltd.
MEB were appointed by EGBC to modernise their church while creating additional church rooms and amenity spaces to increase the buildings capacity. A challenging commission being in a residential setting, on a tight site, located within a conservation area and being locally listed. The height of the development was limited as well as the footprint. Our approach was to retain the worship hall on the street elevation and demolish the various rear additions to make way for development of the rear. By converting the worship hall into two stories we were able to provide additional amenity and function spaces. At the rear a new extension of a worship area, clad in timber, seats 180 people. Between the existing hall and new worship area is a two story link block, rendered grey, containing further accommodation. Being in a residential area the acoustics were key to the buildings success. The worship area is constructed with robust materials to prevent noise breakout, in addition all windows are secondary glazed to further increase attenuation of sound. This created a challenging heating and ventilation strategy to enable the worship area to function without opening windows. Accessibility for all was an important aspect of our design. By demolishing the rear of the church, which had various level changes and excavating we were able to redesign the church without the need for internal steps at ground floor level. There is a small platform lift to the new first floor and an external step lift onto the entrance terrace.